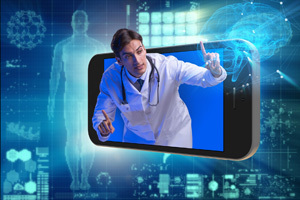 So what exactly is “telemedicine”? The simplest explanation is a patient in one location is examined by a doctor in a different location—a doctor who could be a few blocks away or even thousands of miles away—through the use of computers and a secure video link. These types of doctor-patient consultations are called “e-visits” and, Nebraska Medicine says it can include “[i]nteractive videoconferencing to support specialty services in remote communities, remote patient monitoring (RPM) to support patients as they learn to better manage their chronic diseases and improve their overall health, and video ‘house calls’ with patients at home as they recover from surgery or need additional assistance in their care. Proof that e-visits are joining the mainstream of medicine is evident in the fact that not only do they have Medicare approval, but all private health care plans, the VA and many state Medicaid plans cover some doctor e-visits. “Q: Do I need special computer equipment? Most e-visits are for primary care or follow-up services, such as assessing symptoms or checking on people who have had a medical procedure. But a growing number — no one keeps national statistics — cater to people with chronic conditions who are being monitored at home. Dermatology e-visits are becoming especially common. You can send a close-up photo of a skin rash, mole or other problem for an immediate assessment. Psychotherapy by e-visit is also expanding.